This is a scalable context timeline. It contains events related to the event 6:47 a.m.-2:47 p.m. September 11, 2001: Fire Alarm System in WTC 7 Is in ‘Test Condition’. You can narrow or broaden the context of this timeline by adjusting the zoom level. The lower the scale, the more relevant the items on average will be, while the higher the scale, the less relevant the items, on average, will be. The fire alarm system in World Trade Center Building 7 is placed on “test condition,” which causes any alarms to be ignored, every morning in the seven days preceding September 11. [National Institute of Standards and Technology, 6/2004, pp. 94; National Institute of Standards and Technology, 9/2005, pp. 67; National Institute of Standards and Technology, 11/2008, pp. 69] WTC 7 is a 47-story office building located 370 feet north of the North Tower. [National Institute of Standards and Technology, 8/21/2008; National Institute of Standards and Technology, 11/2008, pp. 2] Its alarm system is placed on test condition “every morning at about the same time” in the seven days before September 11, according to a report by the National Institute of Standards and Technology. Since it will be in test condition on September 11 for a period of eight hours, starting at 6:47 a.m. (see 6:47 a.m.-2:47 p.m. September 11, 2001), the system is presumably put on test condition at a similar time and also for eight hours in the seven days before then. At the end of the eight-hour period, the alarm system automatically returns to normal monitoring. 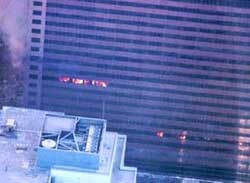 Building 7 of the World Trade Center, located across the street from the Twin Towers, caught fire after the initial attacks on the WTC. [CNN, 9/12/2001] By 4:10 in the afternoon, CNN had reported it being on fire (see 4:10 p.m. September 11, 2001). 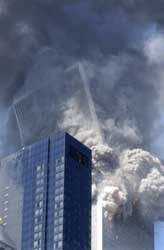 Subsequently it is reported that WTC 7 is in danger of collapsing or may have already collapsed. At around 4:15 p.m., CNN reports, “We’re getting information that one of the other buildings… Building 7… is on fire and has either collapsed or is collapsing… now we’re told there is a fire there and that the building may collapse as well.” About 12 minutes later, BBC reporter Greg Barrow, who is in New York, appears on the BBC radio channel Five Live and says, “We are hearing reports from local media that another building may have caught light and is in danger of collapse.” He adds, “I’m not sure if it has yet collapsed but the report we have is talking about Building 7.” Around this time, the area around Building 7 is being evacuated, apparently because senior firefighters have determined it is in danger of collapsing (see (4:30 p.m.) September 11, 2001). At 4:53, based on the earlier reports, the Radio Five Live show’s presenter will incorrectly claim that Building 7 has already collapsed, saying, “Twenty-five minutes ago we had reports from Greg Barrow that another large building has collapsed just over an hour ago.” [BBC, 3/2/2007] Starting at 4:54, BBC television will also begin reporting that Building 7 has already collapsed (see 4:54 p.m.-5:10 p.m. September 11, 2001). In fact, it does not do so until 5:20 (see (5:20 p.m.) September 11, 2001).